In case you weren’t already aware from the various historical accounts, life in war-time Europe kind of sucked. Fascist regimes from all parts of the world were slowly making their way to its epicentre, bringing with them chaos and dehumanising atrocities to put the innocent civilians in place. It’s of little wonder, then, why so many attempted rebellions against these evil forces ended up either failing miserably, or failing miserably after actually succeeding. 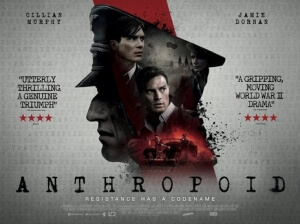 The assassination of Reinhard Heydrich, the Third Reich’s third-in-command and the main architect of Adolf Hitler’s dreaded Final Solution, falls into the latter of such rebellions, one that is now documented in the devastating and sometimes brutal thriller Anthropoid. Heydrich in this film is just a minor character, with little to no lines of dialogue, and merely the target of two Czech agents, Jozef Gabčík (Cillian Murphy) and Jan Kubiš (Jamie Dornan), who are parachuted into Nazi-occupied Czechoslovakia by the exiled government in London. There, they are expected to carry out the mission codenamed Anthropoid, enlisting the help of resistance members led by Jan Zelenka-Hajský (Toby Jones) as well as two young women from Prague (Charlotte Le Bon and Anna Geislerová) to carry it out as efficiently as possible. The first half of this film is mainly focused on the two spies gathering their resources and allies, and though it’s not dull by any means – luckily, director and co-writer Sean Ellis manages to keep things as interesting as possible – it is certainly the slower paced half out of the two, and thus it can be a little trickier to get properly invested in what’s going on. It takes its precious time getting to the main event, making sure that the audience is as familiar with these people as the can be, as well as the circumstances that they have been forced into living, but the characters aren’t quite as interesting as the film wants us to think, and there somehow isn’t enough time to properly establish them as actual people. One of the most striking instances is of an apparent relationship between Murphy and Geislerová’s characters, which given their lack of on-screen chemistry and the film’s failure to even establish them as being attracted to one another – it’s made far more clear with Dornan and Le Bon’s characters, because at least they had a bit of chemistry with each other – it almost comes as a surprise when later on you realise that they were meant to have a connection at all. But instead, Ellis keeps the focus solely on building towards the central mission, and while it’s interesting it’s not enough to make for a compelling first half. Then, the assassination attempt itself takes place, and for me this was when the film finally got moving. The extended scene that everything up to that point had been building towards is dripping with tension, and it’s both expertly staged and even enthralling to watch it all unfold. From there, the film kicks itself into gear with a more gruesome, sadistic, and unapologetically bleak second half, which features an alarming amount of Nazi retaliation following the attack, whether on ordinary civilians or those involved with the two spies. Be warned, however, for this is when the imagery might get a little hard to swallow for some, and I must admit even I felt a little queasy watching some of their horrific torture treatments (all I’ll say for now is, there is decapitation in this movie). As sickening as it can be to watch, I do admire Ellis for deciding to go all the way in showing their brutality following this event, not compromising any of the violence or nastiness to gain a wider audience, and as the film builds to a grand shoot-‘em-up climax set in a church where the assassins are in hiding, you can definitely sense that there is more life and passion put into this half than there is the slower, and less engaging, half. That does make Anthropoid a slightly uneven film, where one half of it is infinitely stronger than the other, but it doesn’t make it an entirely bad film, either. Admittedly, you do have to sift through a lot of tedious backroom chatter to get to the more exciting stuff, but when it does eventually get there it’s fascinating to watch someone like Ellis go as far as they can to show the complete and utter disregard for human life in war-time Europe. There are some genuinely haunting shots in this movie, many of them composed by Ellis who also serves as the film’s cinematographer, which again don’t compromise or sugar-coat the evilness of the Third Reich at all. It’s definitely a very well-made film, and once it does get going it’s a fairly suspenseful tale of one of the most ambitious assassination attempts in the Second World War and the consequences immediately following it, but from a dramatic standpoint where it needs to develop characters and relationships worth caring about, even with something like this which tries to stick as closely to reality as much as possible, it doesn’t work quite as well. Once the ending does come around – after a brief bit of ghostly imagery that’s maybe just a step too far – you’re undoubtedly affected by the events that have occurred on-screen, but not quite as much for the people who this has all happened to. Either way, I am definitely glad that I saw Anthropoid at least once, but I don’t think it’s entirely steady in its overall execution. It’s not a great war drama, but one with enough haunting imagery to stay with you for at least a short while. Anthropoid is a decent but fairly uneven war drama, which suffers from a slower-paced first half that fails to really make a connection with its characters or even parts of the main assassination plot, but kicks more into gear with an explosive and uncompromisingly gruesome second half which gives enough haunting imagery to leave a standard impression.